Whole grain oat flakes and malted toasted whole grain wheat flakes with raisins, whey powder and nuts. 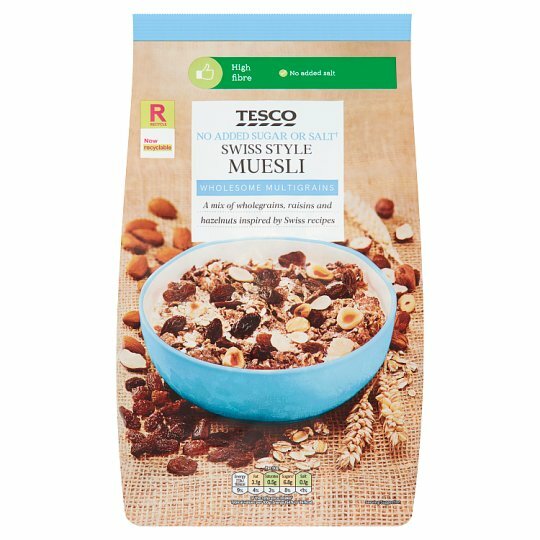 Wholesome Multigrains A mix of toasted grains, raisins and hazelnuts inspired by Swiss recipes We love breakfast. That's why we only work with millers who take pride in what they do and select the most flavourful grains for your cereals like they've been doing for decades. INGREDIENTS: Oat Flakes, Malted Toasted Wheat Flakes [Wheat, Barley Malt Extract], Raisins (15%), Whey Powder (Milk), Hazelnuts, Almonds. Store in a cool, dry place and once opened in an airtight container., Contents may settle during transit. Warning: Not suitable for small children who can choke on nuts.Caution: This product may occasionally contain small fragments of shell.